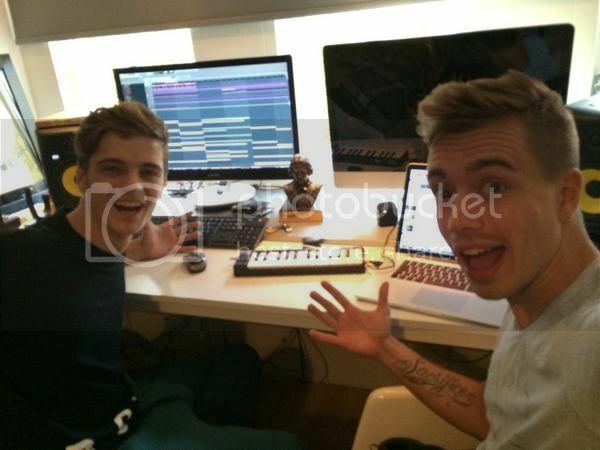 This is the MIDI keyboard Nicky Romero uses when producing tracks on the road and away from his studio. In an Instagram photo he posted he said "Making a track with my new love.. Akai LPK25 #HotelroomSessionsLA"
This Instagram photo by Sebastian Ingrosso shows Axwell using the Akai LPK25 MIDI Keyboard in the studio, next to his MacBook. In this Facebook photo he posted, Adam Beyer is seen using the Akai LPK25 MIDI controller keyboard in his studio gear setup. An Akai LPK 25 can be seen in the Feedback video at 0:48. Chris Lake can be seen using the Akai Professional LPK25 in his post, "This kind of day! New tune in the making with @nomdestripmusic"
In this photo you can see lpk25. We spotted this Akai LPK25 in a photo of Steve Angello working in the studio. Poolside producing with his Akai LPK25 MIDI Keyboard. Fehrplay uses the compact Akai Pro LPK25 MIDI keyboard in his outdoor studio setup. Have to have a Midi Keyboard in all studios. From Andrew's Instagram: "Welcome to the family AKAI LPK 25 !" Syn Cole posted a picture of an Akai LPK 25 on Intagram with the caption, "limited to only 25 keys today. #LessIsMore." Flume's setup includes an Akai LPK25 here, which he picks up and re-orients 8 seconds into the video (revealing the Akai LPK25 logo in the process). in this photo we can see his lpk25! In NEW_ID's photo from Instagram, the LPK25 is part of "[...]how we roll this morning, let's go!" in addition to a MacBook of some sort and an Arturia MiniLab. As seen demonstrated in the YouTube video (@ [2:18](http://youtu.be/PaZ3ZW0QzpA?t=2m17s)), Stromae uses the Akai Pro LPK25 USB MIDI keyboard to lay down some melodic bass line notes with [Propellerheads Reason NN-19 Sampler](http://equipboard.com/items/propellerheads-reason-nn-19-sampler). The compact keyboard has become an apparent trademark to his production as he has been seen brandishing it in many interviews, videos of performances, as well as in some press photos like [this one](http://2.bp.blogspot.com/-oBFlpAiNh0E/TiSkrvc-OzI/AAAAAAAABGc/-e0XLxFk53U/s1600/1301064046_STROMAE1.jpg). Will Sparks using this MIDI Keyboard to make a song in a car. In this Instagram photo posted April 2014, Tchami shows his Akai LPK25 MIDI Keyboard. He says, "New setup. Keeping it organic." On the left side of this Instagram photo showing Adrien Mezsi's studio gear setup, his Akai Pro LPK25 25-Key USB MIDI Laptop Performance Keyboard can be seen. Photo posted August 2014. At 1:40 you can see Mannie Fresh using the Akai Professional LPK25 midi keyboard. He used the keyboard in rhythm roulette to lay down his drums. Jamie Lidell is shown using the LPK25 as the master controller for all of the connected synths in his Studio B. On this Triple J live performance, Tord played an Akai Pro LPK 25-Key. You can see it in bits such as 2:15. Jerome Isma-Ae can be seen using the Akai Pro LPK25 MIDI Keyboard in this photo he uploaded on his Instagram. At 0:54, 45 King says, "And then I have a little small keyboard to record mini notes into Logic 9," and his Akai Pro LPK25 can be seen. in this photo we can see his lpk25..
A shot of William's home studio, apparently doing some laptop MIDI work. In this vine video $1 Bin is seen with the LPK25 to produce music. in this photo we can see his akai lpk25..
in this we can see his lpk25! An Akai Pro LPK25 can be seen in this Facebook post by TV Noise. He uses it live on this video. You can see it on top of another bigger keyboard he uses too. The LPK 25 is a standard USB midi keyboard with 25 keys. It is small, the touch of the keys is not very nice, but it does the trick. When I play melodies, I do it freely mostly before I put additional work on the played sequences within the computer. I can take it with me anywhere and it comes in very handy when I know i won't be home for more than two weeks. I would not take it with me for just one week, as then the laptops internal keys would be enough. An Akai LPK25 can be seen at 0:11 in this video of Noah "40" Shebib working in the studio. The Akai LPK25 can be seen in this Instagram pic. Posted on the band's official Facebook page, drummer Frans Povel is seen playing a piano with the Akai LPK25 in the foreground. DJ Dahi can be seen using an Akai LPK25 in the video at 0:49. This keyboard was seen in the cover of the Justin Bieber song 'Beauty and a Beat' on YouTube. Kurt's keyboard is showing at 1:20. Zaytoven makes a beat live on stage. At 3:17 you can see Zaytoven performing on the Akai LPK25. In this YouTube video at 0:20, Hundred Waters can be seen performing with the Akai Pro LPK25 Keyboard. Free K Dominguez of Kidneythieves seen using a Akai Pro LPK25 25-Key USB MIDI Laptop Performance Keyboard in their studio in a picture posted on their official Instagram. At the end of this vine, the Akai Pro LPK25 can be seen as he's zooming on his robots. His Akai MIDI keyboard is laying infront of him on his mixing desk. This item can be seen in this Instagram picture, taken by Kungs himself. Tim's setup has a Launchpad Mini, an MPD18, and an LPK25. In this photo from SOUND DESIGNER magazine, you can also see her Akai LPK25 USB-MIDI keyboard controller and Novation Launch Control, as well as a Launchpad. This item can be seen in this Instagram picture, uploaded by the artist himself. Ramzoid uses it at the start and all throughout the video. Very small compact MIDI keyboard that does the job very well, and is a very good price. I want to get into producing, need something super portable and light so I can work on music wherever. Great quality with minor quirks. Does the job. Just wish the keys were a tad more sensitive in registering velocity. Nice and solid construction, does the job pretty well, but tends to lose its connection from time to time. Lack of a pitch bend control is the only serious flaw though. I use this mostly for working out note sequences in the studio, rather than for performance or anything like that, and for that it's perfect. BRGR uses AKAI LPK25 sometimes. This little guy sits right between my iMac and bluetooth keyboard. It's always plugged in, and ready to go for whenever I launch Reason or Logic. It's light, simple, looks great easy to play, and overall just really convenient. I also like to take it on trips and compose on the go. Great keyboard. Keys feel fantastic. Using it for my mobile studio setup. Sometimes also in my studio. Save space on my desk. I carry this thing around with me a lot. Wonderful for arranging on the spot with my Macbook. Key feature being its size. the fact that 25 keys are present and octave control exists is absolutely insane. it may not seem that drastic but if you produce in a small environment and have nowhere to place a huge midi piano, then yes. this majestic keyboard is for you. I love this little controller. I've taken it with me on many trips. The controller fits on top of my 13" Macbook Pro perfectly and gives me the ability to add arps to any instrument. Fits into any backpack easily. Will always keep this controller. Nothing spectacular but useful at times. I really love this keyboard, not just because it's very portable, but most important: the keys feel realistic. It's very nice to create simple melodies or basslines.